For a number of days this past week I was in and around Narragansett Bay. On a good wind, the boat and I went the 25 miles or so from Noank, Connecticut to Dutch Harbor, Rhode Island, and had a sweet night anchoring in the tiny south cove on Dutch Island, protected from the northwest wind. It’s a little roly, open directly to the south and out the bay, but it was great to be out of the wind. I’d never been in to that particular spot, and it was a treat. The next day, it was up to Wickford, to be out of the new south wind, and the strong northwesterly forecast for the next day after that, and hopefully some visiting with friends. 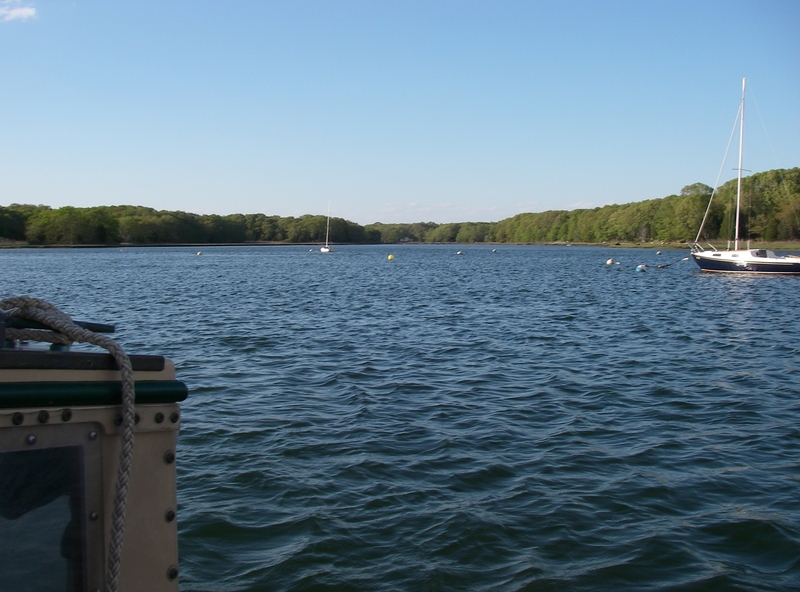 There’s a great cove, well inside that harbor, with moorings and enough water on the edges for comfortable anchoring. The first night was fine, and half the next day. It’s beautiful in there, with marsh, and trees, and egrets working in the shallows. This was all very disconcerting, and more so when I brought up about the weather of the moment and was told something about how many times he hears that. He must have seen the worry all over my face, at the prospect of trying to move the boat effectively onto a mooring or into a slip in that amount of wind, because he relented, and said that I could stay until morning. This in spite of his having received TWO complaints! 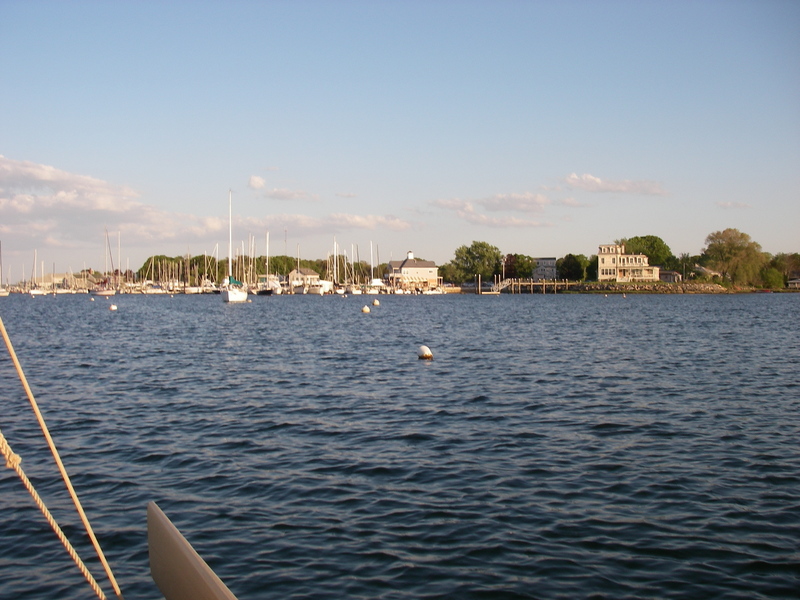 One wonders from whom – there are houses scattered along the shore, and very small amounts of boat traffic, being at the far inside end of the harbor – perhaps the folks on the workboat out tending to moorings were unhappy? Or at the marinas, in view down the way? After the police boat left I did two things: called my friend Sarah, who lives up the cove, and got on the town website. Sarah very kindly chased around and made arrangements for use of one of the local yacht club moorings, which I moved to early the next morning when the wind had eased up. The town website was fascinating: rather than a prohibition on anchoring, it stated that “No person shall anchor or moor a vessel in any anchorage, mooring area, or mooring field in a manner or in a location which under the circumstances existing creates a probability of damage to other vessels moored or anchored nearby.” http://www.nkpolice.org/Old%20Site/Harbor%20Division%20New/Harbor%20Ordinances%203.htm#Sec.%207-81%20Thoroughfares;%20designation;%20moorings,%20anchoring%20and%20swimming%20prohibited; ( Sec. 7-106. (c)) There’s also, very reasonably, no anchoring allowed in channels. It had been a couple of years, before this recent visit, since the last time I was in Wickford. Rules change, but also, when I’d been there before it had generally been in the middle of the season, with the harbor jammed full of boats. If somebody really paid attention, they could have noticed that I was anchored (in this boat, or in the little Peep Hen SERENITY), but for the most part I think that my presence blended in. Ironically, now after such a long, late winter, there is loads of room in the harbor, but now is the time that I get kicked out! I debated going into a slip, which I’ve also done on a few occasions, when I’ve stayed several days at a time for both shore support and repairs, and even for hurricane Sandy. This time around, it was Friday of Memorial Day weekend when I was given notice, and if I had acted quickly I’m sure that I could’ve made arrangements for a Saturday arrival. Visiting would have been easier, if I had done that! Only the upcoming hot weather forecast dissuaded me. Instead, next day, after a breakfast stop at that nice mooring, I caught the north wind back down the bay to Dutch Harbor (which runs about 10° cooler than Wickford when the weather heats up). About the time I arrived, as predicted the wind shifted south, where it was expected to stay for days. Heading for another favorite anchorage, I anticipated being well protected from that strong south wind. No deal. In exactly the spot that lets a small boat get close enough to the shore to not get bounced around, the area is now outlined in buoys that are labeled “conservation area” and “no anchoring.” Anchoring is available, but out so far from the shore that in a 15 knot wind through the night one is pretty much guaranteed a miserable time. Rats! Having so recently had that police experience, I wasn’t keen on inviting another one, especially in the face of specific signs, so I passed it by. Instead, since I was likely to bounce around no matter what, I rented a mooring, which achieved also having launch service, so that folks could come visit. There are no slips in Dutch Harbor. The wind blew like they said, the boat bounced, and I made plans to get out of Dodge. Suzanne came early the next morning, bringing supplies that were to have come the day after that with Amanda and Alaina. Amanda and her sister had been planning to come for a sail, after all that work on rigging the boat, but then had car trouble and had to postpone. In the end, both that and other visits were sadly missed, but Suzanne and I got a bonus hello, when she made that quick run on Sunday morning. Then off I went, with hopes for my third regular anchoring spot in Narragansett Bay to be more successful. 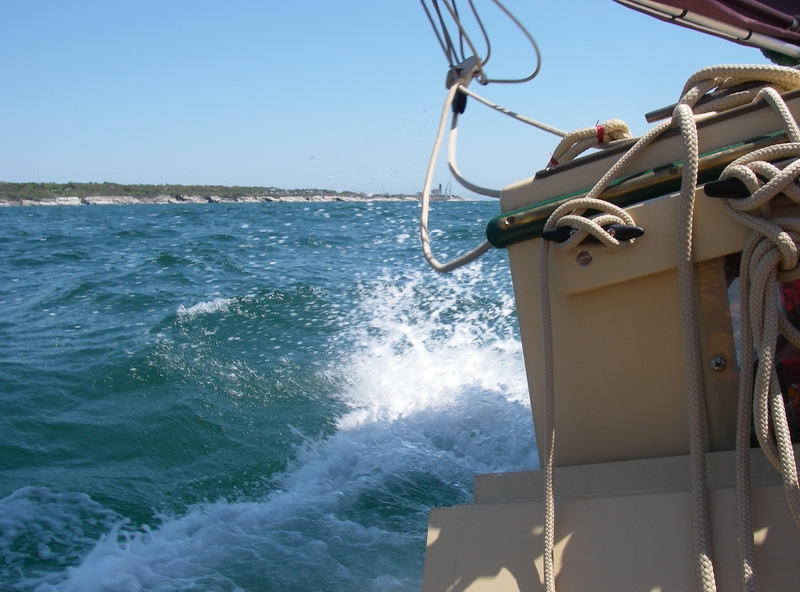 This next one, fortunately, was indeed better, and I arrived towards evening after a nice, feisty sail of 10 miles or so (okay, so four hours were spent tacking against the current, to get the 3 miles out of the westernmost arm of Narragansett Bay – but it was still fun). This new spot was near the mouth of what’s called the Sakonet River – actually a long bay, the easternmost arm of Narragansett Bay – where there’s a beach that extends perfectly for protection from southerly winds. There are some moorings, and when I arrived, three or four boats were at anchor. As I approached my favorite corner, close up to the beach for least bouncing, a little ways away there were some of those stick bouys that can mean so many things. I didn’t go close enough to read whatever they might have said… Sometimes you just don’t want to know. After two nights and a good rest, on leaving I was happy to see that indeed those buoys said nothing about anchoring. But they could have. It’s a frustrating thing, to see so many good anchorages blocked off, causing unnecessarily difficult nights for those in small boats. Stage Harbor, in Chatham, was the same way a couple of years ago. With a perfect tree-covered bluff over the curve of the harbor, sheltering from prevailing winds, anchoring is only allowed inside a wide-open sand spit. Safe, but pounded by the wind, in perfect sight of sheltered peace, with plenty of room available for small boats with a shallow draft. I don’t understand the reasoning for these rules, in harbors were there is indeed plenty of physical space. Perhaps there have been abuses of hospitality. Regardless, there are legal debates ongoing about who has jurisdiction over the water in those perfect coves; it’s possible that towns have no legal standing in establishing these kinds of restrictions. While all the concerned parties sort that out, my primary solution is to go north, beyond the crowds. Thank goodness that’s still possible! Downeast Maine is calling, loudly. Soon, I say, soon. It seems like more places just want to cater to the the high revenue crowd. They treat the voyager like an alien creature intruding on their territory. The adventuresome would look differently, but too many just look possessively at the space. Fortunately there are still many who can picture trading places or admire the cruising spirit. I invite you to stop in Annapolis Royal NS. I don’t think there is any charge for using their new guest moorings. Also they now have a float near the end of the town wharf so one can get out of a tender at any tide and go up a metal ramp (impossible for my tough bare feet!) which is steep or shallow-sloped, depending on the height of the tide. The float assures your tender is still at water level and neither hanging high in the air nor tied low and drowning if you are gone for a couple of hours or more. We have about 25 feet of tide here. What a lovely invitation – I dearly hope to take you up on that! Gotta love those Fundy tides. I’m very much looking forward to being up there one day, to watch them come and go. And I look forward to being here to welcome you ashore! Can offer hot shower, too.